Oceania Dive Expo (ODEX) - Holds the annual Dive Expo Show in Brisbane and Sydney which has been very successful over the years. 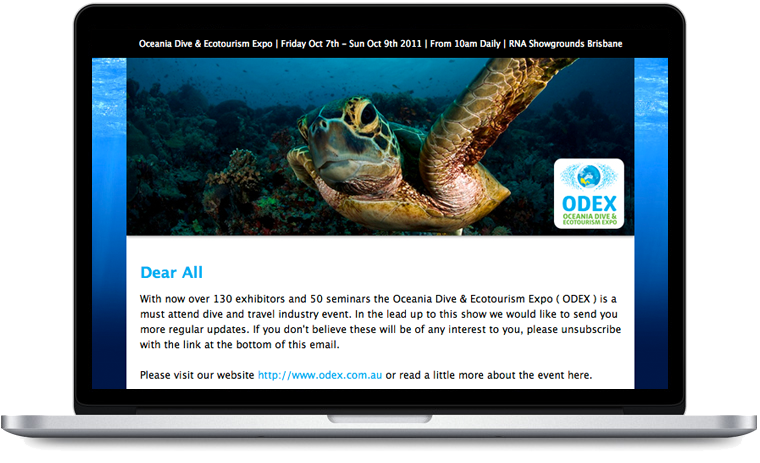 ODEX came to us with a database that needed to be cleaned and to also integrate their Email Marketing Campaign through the use of various templates and emails leading up to the event and throughout the year. Our approach was to work with ODEX to get their database cleaned and ready for sending and to also provide them with a raft of templates to suit their needs for each dynamic Email Campaign they sent. We also came up with very smart design allowing for variable lengths in content and still in keeping with their current website design to create a uniform look throughout their branding. We have been managing their Email Marketing Campaigns for many years now and they are very happy with the results and growth.